I checked in to 9 places, took 1 photo, wrote 1 microblog, and walked 4.3 miles. I was in Des Moines, Urbandale, and West Des Moines. 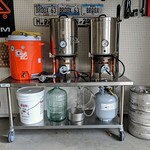 Just upped our homebrew game. Thanks, Craigslist.